Have you ever stopped to compare the carbs in your favorite candy? Why ruin a good thing, you say? Well, perhaps, if you can make some educated choices on the front end, you or your child can avoid a blood sugar spike on Halloween night and in the days that follow. The Diabetes Forecast has an easy reference guide showing the carb count in the most popular Halloween candy here. The short of it is that the fun size candies range from about 8 to about 15 carbs per bar or bag. Hopefully, your kids also visit a few teal pumpkin project houses (allergy friendly families) who have handed some candy alternatives, like toys or healthier snacks. We like stickers, mini containers of slime, Pirate’s Bootie and Halloween shaped pretzels. But, if you worry about depriving your T1D kid, do your research in advance so you can accurately carb count what they want to eat. Bring low carb snacks for while they are out trick-or-treating, and save the candy for when you get home. 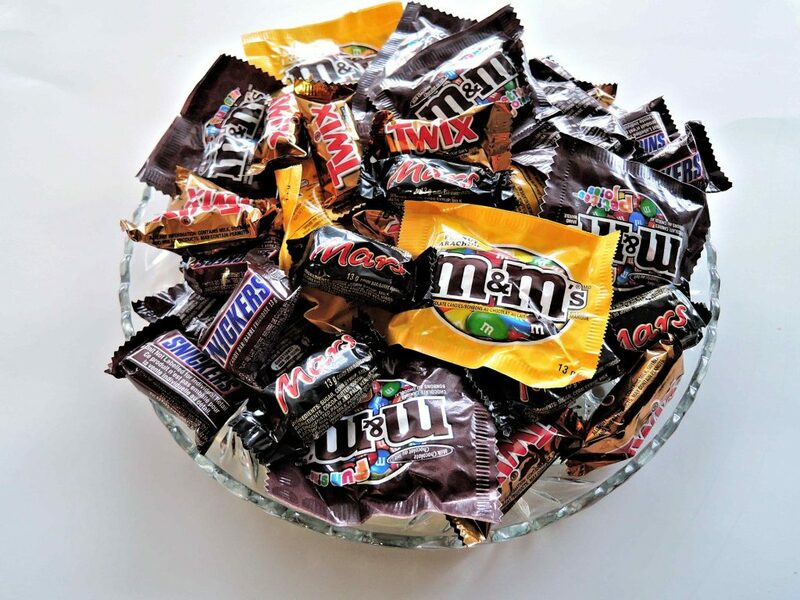 Ask them to choose 5-6 pieces (preferably the mini sized chocolates because those range from 4-7 carbs per candy). Let them enjoy those favorites on Halloween night, and then take the rest away. Some parents buy the candy from their kids at 5 or 10 cents a piece, and some squirrel it away to treat lows. In our house Halloween is one day, not the entire next month. So on November 1, the candy stash disappears. Your child’s teachers and babysitters will thank you.